Morobe province will be the next province to be granted a Provincial Health Authority by the National government before the end of this year. Health Minister, Sir Dr Puka Temu, made this announcement in Lae during the official launching of the mass immunisation program against the polio outbreak in the provinces of Morobe, Madang and Eastern Highlands. Morobe Governor Ginson Saonu who was made present, welcomed the announcement, after years of poor working relationship between the different stakeholders resulted in the PHA status granted to a few smaller provinces. One of the reforms under the Health Department is the establishment of the Provincial Health Authority in each provinces, which the minister said will cut down on many of the beauracratic red tapes and funding problems. Minister Temu said this will help progress the public health system of the country as a PHA will see a provincial hospital merging with all health centers and aid posts in the districts and wards, into a single structure, operational plan, management and board. The former health secretary said having a PHA will guarantee a Health Functional Grant from the national government, which should assist with the financial woes facing the health divisions in the provinces. Minister Temu pointed out that it is very important that the Morobe PEC appoint people on merit to head its provincial health authority. 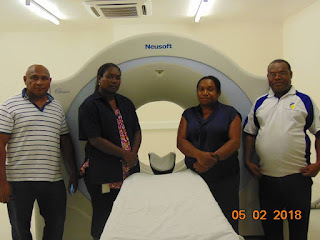 The Morobe provincial executice council under Governor Ginson Soanu, has already passed a resolution and recommended a provincial health authority board for the national executive council for approval.